“This straw-targeting of Christianity is now drearily commonplace among academics and intellectuals—that is to say, among those who would not allow a first-year student to get away with the vulgar caricatures in which they themselves indulge with such insouciance” (p 52). Terry Eagleton’s invective against anti-theist’s claims about religion, and Christianity in particular, is one of wit, humor, and sauce. One hopes that those that are curious about the popular anti-God rhetoric, but who are basically outsiders—neither informed and faithful Christians or card-carrying anti-theists—will be the prime readers and beneficiaries of this “lecture series” book. Not that there isn’t a good deal that those in the other groups can get out of it. Indeed, as the Booklist review asserted, “serious Christians may be [Eagleton’s] most appreciative readers.” But on the opposite side Eagleton himself opined that there was not a “hope in hell” that Ditchkins, that is Richard Dawkins and Christopher Hitchens, would read his work or be moved by it. 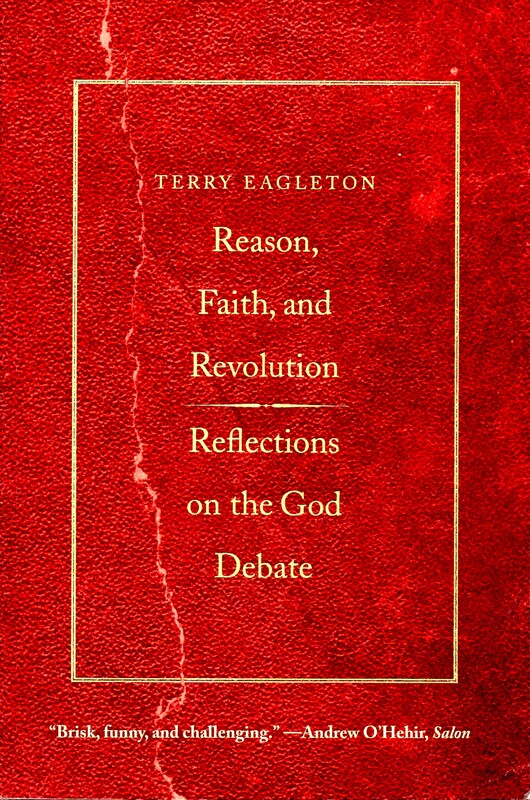 Eagleton, who is a professor both of English literature and culture theory, and who also writes philosophically (in fact, this book has been rated as important in philosophy), presents how the various arguments against religion that Dawkins and Hitchens vehemently espouse are very seriously misinformed and flawed. “. . . the relations between these domains [poetry and other language types] and historical fact in Scripture are exceedingly complex, and that on this score as on many another, Hitchens is hair-raisingly ignorant of generations of modern biblical scholarship” (p 54). He shows how Dawkins’ views, which reflect Victorian era progressivism, are simply unreasonable and unrealistic. “We have it, then, from the mouth of Mr. Public Science himself that aside from a few local hiccups like ecological disaster, ethnic wars, and potential nuclear catastrophe, History is perpetually on the up. Not even beaming, tambourine-banging Evangelicals are quite so pathologically bullish. What is this but an example of blind faith? What rational soul would sign up to such a secular myth?” (pp 87-88). Regarding Ditchkins and science, Eagleton discusses how “Dawkins falsely considers that Christianity offers a rival view of the universe to science” (p 6), and that “His God-hating is by no means the view of a dispassionate scientist commendably cleansed of prejudice. There is no such animal in any case” (pp 65-66). “[Scientists] are peddlers of a noxious ideology known as objectivity, a notion which simply tarts up their ideological prejudices in acceptably disinterested guise” (p 132), and Dawkins, for example, “castigates the Inquisition . . . but not Hiroshima” (p 133). While anyone is welcome to criticize superstition, the current culture has sunk into scientism, which refuses to take anything seriously that “cannot be poked and prodded in the laboratory” (p 72). “Ditchkins does not exactly fall over himself to point out how many major scientific hypotheses confidently cobbled together by our ancestors have crumbled to dust, and how probable it is that the same fate will befall many of the most cherished scientific doctrines of the present” (p 125). In chapter 1, Eagleton presents basic Christian beliefs not only to show that Ditchkins does not have an understanding of them, but to also promote them as quite respectable. Of course, throughout his book Eagleton gives little quarter to “fundamentalists;” he praises Jesus and his radicalness, and those who actually follow His teachings to help the poor and seek justice. He also contrasts this Christian mandate to love socially to the liberal humanist (of which Ditchkins is an example) legacy of love being kept private. Yet another significant difference between Christianity (and for persons like Eagleton who hold a more socialist view) and the liberal humanism of Ditchkins is the matter of sin and redemption. To Ditchkins, there is nothing to redeem. Humanity is steadily progressing, even if catastrophes like World War II have happened. “In my view,” Eagleton writes, “[scriptural and orthodox Christianity] is a lot more realistic about humanity than the likes of Dawkins. It takes the full measure of human depravity and perversity, in contrast to . . . the extraordinarily Pollyannaish view of human progress of [Dawkins’] The God Delusion” (p. 47). Christianity believes that there are “flaws and contradictions built into the structure of the human species itself,” and so violence in history is not just due to historical influences; and Christianity is hopeful. It is “outrageously more hopeful than liberal rationalism, with its apparently unhinged belief that not only is the salvation of the human species possible but that, contrary to all we read in the newspapers, it has in principle already taken place. Not even the most rose-tinted Trotskyist believes that” (pp 48-49). There are all kinds of fun passages like those already quoted in Eagleton’s book. It can be very useful to Christians who want to be able to cite a seemingly non-Christian critique to the anti-theist crowd. Conservatives be warned, however, that Eagleton presents and is supportive of Liberation Theology (he is a Marxist who aligns himself with “tragic humanism”), and is very critical of modern capitalism and western foreign policy. He has good, though general, arguments for the atheism of capitalism and the disconnect between the West’s religious rhetoric and its actual practices (which, interestingly, he often places on liberal humanism). Indeed, Christianity’s lack of following its leader has brought much criticism upon itself, “Christianity long ago shifted from the side of the poor and dispossessed to that of the rich and aggressive” (p 55). “Such is Richard Dawkins’s unruffled impartiality that in a book of almost four hundred pages, he can scarcely bring himself to concede that a single human benefit has ever flowed from religious faith, a view which is as a priori improbable as it is empirically false . . . . and this by a self-appointed crusader against bigotry” (p 97). Speaking of empiricism and truth, I found chapter 3 more interesting the second time I read it. It’s really a pleasant read and borders on the mystical in places. Eagleton writes lucidly on how we understand truth and what is reasonable and rational. A set of examples about what is reasonable and rational, relative to what is true, is (1) that of humans previously thinking that the sun circled the earth – since it certainly looked that way it was rational to think – and (2) what we know of certain nuclear particles in our present time. These particles are said to go through two different spaces at one time. This is not rational or reasonable, yet we think that it is true. He continues with a discussion that promotes the concept of “love” being a precondition of understanding, concluding that “The rationalist tends to mistake the tenacity of faith (other people’s faith, anyway) for irrational stubbornness rather than for the sign of a certain interior depth, one which encompasses reason but also transcends it” (p 139). “Yet the Apocalypse, if it ever happens, is far more likely to be the upshot of technology than the work of the Almighty. . . . This, surely, should be a source of pride to cheerleaders for the human species like Ditchkins. Who needs an angry God to burn up the planet when as mature, self-sufficient human beings we are perfectly capable of doing the job ourselves?” (p 134).